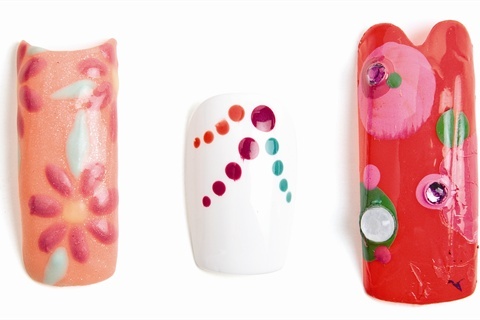 Three nail artists create nail art inspired by the Pantone Color Institute's predicted Spring 2011 color palette. Citing exotic destinations like Africa, India, and Turkey as inspiration for spring 2011, designers continue to satisfy consumers’ need to escape everyday challenges with intriguing color combinations that transport them to foreign lands. “The colors designers have chosen for the spring season present an interesting marriage of unexpected warm and cool tones,” says Leatrice Eiseman, executive director of the Pantone Color Institute. 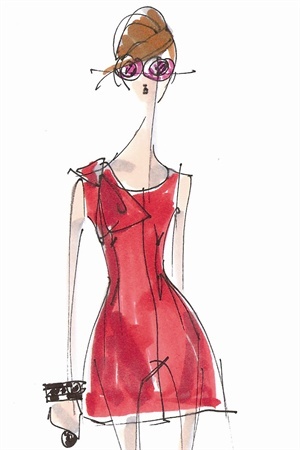 “By cleverly combining complementary colors, those that are opposites on the color wheel, they have created a striking intensity to the palette.” The Pantone Fashion Color Report Spring 2011 predicts that honeysuckle (shown in illustration — and also named by Pantone as the “color of 2011”), coral rose, peapod, and seven other hues will make up the palette of the season. View the full report at www.pantone.com/spring2011. View a slideshow of all 10 spring shades at www.nailsmag.com/spring2011colortrends.